1. I don't look good in pregnant. some people don't look good in orange or green. I don't look good in pregnant. I'm not graceful or cute, just awkward and round. I only have 16 weeks left, so I think I can deal with my predicament for now. 2. I might never be cool again. I saw a early twenties blonde girl cruising down West End yesterday, she just looked cool and then it hit me, I will never be that cool again. I will be too worried about Parker and being a mom to look or even play that part again. Maybe I can make baby drool the new cool? 3. I won't see my feet again until 2011. I'm slowly learning to deal with each of these things. As long as I can fit back into my jeans once Parker arrives, life will be good again for me, cool or not. 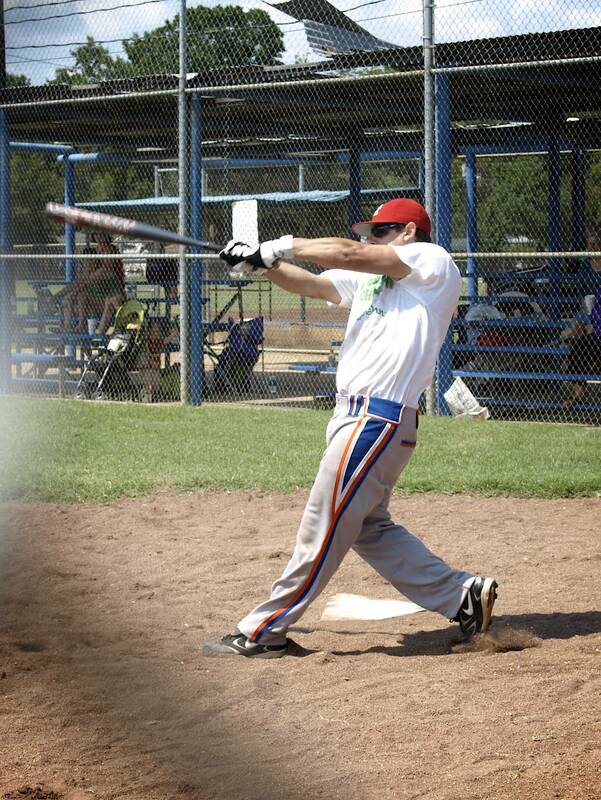 **This is a photo of Kevin from the softball tournament he played in over the weekend. He looks cool here, so I thought this might up my cool factor. Photo courtesy of Jaime Mitchell. i bet kevin hit a soft ground ball to the shortstop. He is so lazy, he probably didnt even run it out.